He was a spitting image of his father and had the sneakiest little grin on his face. “A new tiny heart grew inside of mine that was as rich and wonderful and as full of love as the other. What a relief, and what an amazing ability we have as humans. As parents, each child in our life brings forth a new living, growing, beautiful heart that adds to the fullness of our own hearts. But what happens when one of those hearts break? What happens to our hearts when we lose a child?” After two short weeks of life, Marshall James Knobben passed away in our arms in the middle of the night. My world froze and I was forever changed. Over 8 years ago, we said goodbye to the life we knew and the most wonderful, beautiful little boy. This is where the seed of Carry You With Me began. Turning to pen and paper in that first year helped me communicate with Marshall and work through the prisoning emotions. The weeks leading up to his first birthday saw the first draft of Carry You With Me hit the pages in my journal. It took me over six years to evolve it and gain the courage to ask artist Katie M Berggren if she would partner with me on this special project. Seeing her creations was like seeing my imagination of the words coming to life. I nearly melted when she said yes to illustrating the storybook. The experience of developing the paintings with Katie was the most fulfilling and enjoyable project I have ever worked on. From describing each line in emotions, colour, music, imagery and symbolism to collaborating on the sketches, first paint and composition to the final coloured masterpieces. I can’t wait until one day when it is time for our next one, fingers crossed! &Then design became the next creative team to help me work through my head and heart to create a brand that would carry the message and soul of what Carry You With Me is. Working through different concepts we landed on something that connected so deeply for me and the underlying constant of the double heart, always connected, and centred in love. We worked together to make the meaningful mementos collection a reality. A new beginning for Carry You With Me and a special way to connect with and support bereaved families. From the moment I said out loud that I was going to actually create the Carry You With Me Storybook, I knew there was so much more. 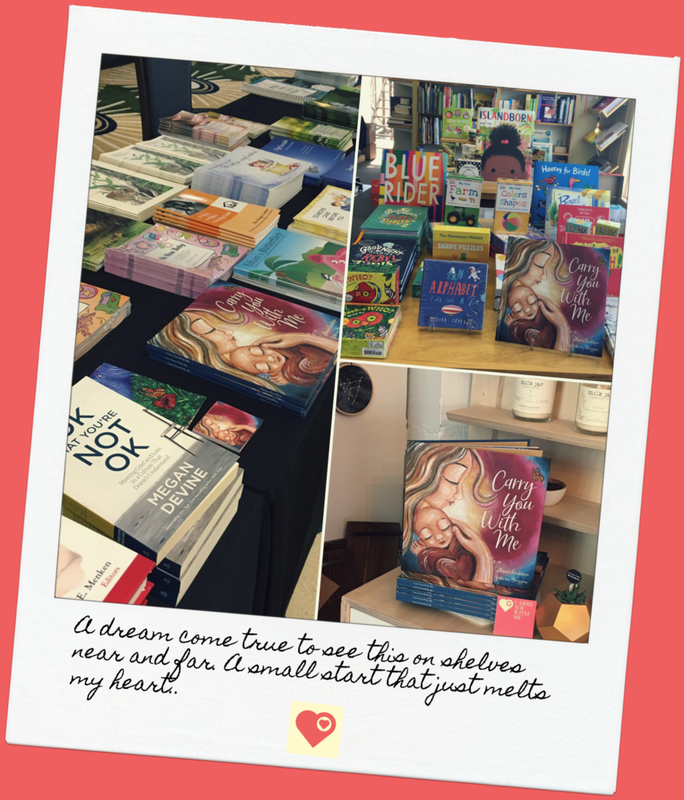 I realized so much of what was in my heart was a yearning to connect with others, like me. Find a new tribe. Those that had been through this and could see me for the person I am now and just get it. There was a deep passion to support others and be there for them as they took steps forward into this new, difficult and often terrifying path. The CYWM Community immediately became a focus of my attention. Together we have worked to create a safe place for support, remembrance, healing and hope. Together we share openly our sadness, fears, joys and lessons that may help ourselves and others dealing with miscarriage and child loss. A place to find some comfort in stories that resemble our own feelings or experiences, to say their names, and know that we are not alone. In this group you will find the truth and beauty in the stories and rawness of experiences from every stage of this grief. You will also find little sources of inspiration to remind us that joy is part of the process. From pictures of flowers, beautiful artwork, and quotes to music, articles and custom meditations. Thank you to all of our growing contributors. A special heartfelt thank you to Trina Metz for creating meaningful and simple monthly guided meditations for us all. I find myself going back to them whenever I need a little boost. Stay tuned for some exciting art work, interviews and other connected content coming up this year. I had a scroll through the members list in the community and wept. I felt such awe and to be honest, a little shock, of how many of us there are that have suffered a loss. It really took my breath away and we are only a few. There are so many families affected by this sadness and trauma. At the same time, I felt comfort in knowing that we are not alone. I was warmed by the thought of feeling stronger that I have you in my life and that I am learning from you in everything you share, connect to, and allow me to share. This has been an incredible discovery and healing process. I felt humbled to partner with the Royal Alexandra Hospital Foundation and Lois Hole Hospital for Women, in Edmonton, early last year. Thank you to the Burkholders for making this possible and all the wonderful new friends at the hospital. As the year went on I was so excited to interview some amazing leaders in this area and tour hospitals in Edmonton, Toronto and Regina to learn more about their loss programs and facilities. My eyes were opened up to a world of supports, incredible new friendships and endless possibilities. I have learned so much this past year about perinatal loss and myself. Spending hours collaborating and dreaming with local groups such as Avery’s Legacy and Hazels Heroes. Attending the October PLIDA conference in St Louis was an experience I will never forget. Lots more to come from this. The excitement of TV interviews spreading awareness to cherishing our family memories at A Walk to Remember, Tiny Footprints Gala and Wave of Light. Each moment has been so special. 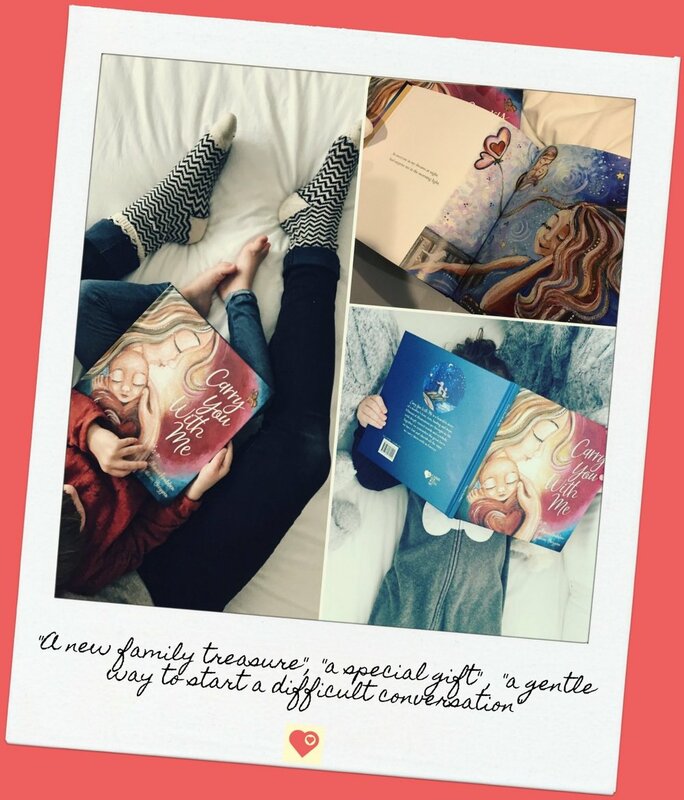 You have shared on how the storybook has become a family treasure and some of you have shared your new found inspiration to share your truth with courage and grace to the outside world. The compassion I have seen in other’s reaching out to support their loved ones, the photos, the tattoos, the hugs, I am so grateful. Many orders have had me in tears reading the touching inscriptions provided. Each one packaged with care and intentions for healing and hope. The hidden hearts have been something I have been looking for since Marshall passed away. Thank you for embracing the challenge and continuing to share all the hidden hearts you discover along your path. They are out there. Each one makes my heart feel more full and makes me believe. I wish the same for you. I often joke about magic and I do believe in miracles, but what we have here is neither. It is simple and real, a band of individuals coming together in our grief to shed light on our experiences, share compassion for each other, explore new joy and remember our passed children together. Thank you. Sending you love and light always.